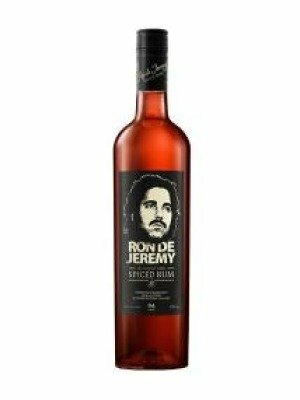 Ron De Jeremy Spiced Rum Panama Aged Spiced Rum is a popular Rum available from DrinkSupermarket.com in 70cl to buy online. Visit DrinkSupermarket.com for the best price for 70cl of Ron De Jeremy Spiced Rum Panama Aged Spiced Rum or compare prices on our other Rum products. Ron de Jeremy spiced rum has an amazing depth of flavour. It is skillfully blended using all natural ingredients, to give a rich and well rounded rum. Deep caramel in colour, this complex rum dispays notes of nutmeg, ciannamon and vanilla with hints of black coffee and lime. As you would expect from the risque world of adult entertainment, this spiced rumm packs a hefty punch at 47% ABV, the slight touch of burn heightening the pleasure. Ron de Jeremy Spiced excels as a sipping or mixing rum - even as a straight shot for the more adventurous. The sign of a good rum. Thsi well rounded and complex rum was awarded the highest accolade at the SIP International Spirit Competition 2012 achieving Platinum - Best of Class in the Spiced Rum catagory. Where to buy Ron De Jeremy Spiced Rum Panama Aged Spiced Rum ? Ron De Jeremy Spiced Rum Panama Aged Spiced Rum Supermarkets & Stockists. You can buy Ron De Jeremy Spiced Rum Panama Aged Spiced Rum online in most retailers and find it in the Rum aisle in supermarkets but we found the best deals online for Ron De Jeremy Spiced Rum Panama Aged Spiced Rum in DrinkSupermarket.com, Amazon.co.uk, TheDrinkShop, and others. Compare the current price of Ron De Jeremy Spiced Rum Panama Aged Spiced Rum in 70cl size in the table of offers below. Simply click on the button to order Ron De Jeremy Spiced Rum Panama Aged Spiced Rum online now.